Datalogic, a global leader in automatic data capture and industrial process automation will be exhibiting wireless charging technology in booth 1641 during HIMSS 2019 at the Orange County Convention Center in Orlando, Florida, this February 12 – 14. Charging contacts have been the number one failure source in the automatic data capture industry for decades, leading to downtime due to broken, damaged or corroded contacts and slow charging capabilities. To solve this issue, Datalogic turned to the Qi Standard, the battery charging standard popularized by Apple and Samsung. The Qi Standard relies on a contactless charging premise. No contacts translates to zero maintenance and charging related device downtime. In booth 1641, Datalogic will present its new generation of contactless charging devices for healthcare applications: The Gryphon™ 4500 2D area imager and the Memor™ 10 PDA. The Gryphon™4500 imager is the only inductive contactless charging handheld scanner on the market. This next generation Gryphon features 2D bar code reading capabilities, multiple interface options, corded and cordless versions, and disinfectant-ready and anti-microbial plastics to mitigate the spread of bacteria. 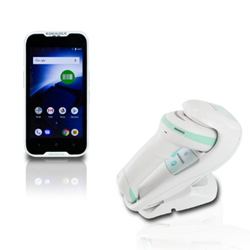 Memor™ 10 PDA features Android 8.1, two dessert upgrades at the minimum are guaranteed, a slim 2D imager, disinfectant-ready healthcare plastics, and voice over IP calling. It’s the only PDA on the market with a one-piece swappable battery and inductive wireless charging for non-stop use. The Memor 10 PDA is backed by Google’s “Android Enterprise Recommended Program”. Datalogic’s healthcare team will be on-site at booth 1641 to answer visitor questions and demonstrate the company’s latest products. Amazon Echo Spots will be raffled off to contestants who enter the drawing. Datalogic is a global leader in the automatic data capture and process automation markets, specialized in the designing and production of bar code readers, mobile computers, sensors for detection, measurement and safety, RFID vision and laser marking systems. Datalogic solutions help to increase the efficiency and quality of processes in the Retail, Manufacturing, Transportation & Logistics and Healthcare industries, along the entire value chain. The world's leading players in the four reference industries use Datalogic products, certain of the attention to the customer and of the quality of the products that the Group has been offering for 45 years. Today Datalogic Group, headquartered in Bologna (Italy), employs approximately 3,100 staff worldwide, distributed in 30 countries, with manufacturing and repair facilities in the USA, Brazil, Italy, Slovakia, Hungary and Vietnam. In 2017 Datalogic had a turnover of 606 million Euro and invested over 55 million Euros in Research & Development, with an asset of more than 1,200 patents in multiple jurisdictions. Datalogic S.p.A. is listed in the STAR segment of the Italian Stock Exchange since 2001 as DAL.MI. More information about Datalogic at http://www.datalogic.com . Datalogic and the Datalogic logo are registered trademarks of Datalogic S.p.A. in many countries, including the U.S.A. and the E.U.